Qadiriyya is the first Sufi order to be introduced to China. The Qadiriyya is believed to be preached by Khawja Abdullah who was the 29th generation descendant of Prophet Mohammad. Khawja Abdullah entered China in 1674 and preached from Southern China’s Guangdong and Guangxi provinces to Southwest China’s Yunnan and Guizhou provinces and finally arrived in Northwest China’s Gansu Province. Khawja Abdullah is said to die at a very old age in the place named Langzhong (阆中) in today’s Sichuan province. 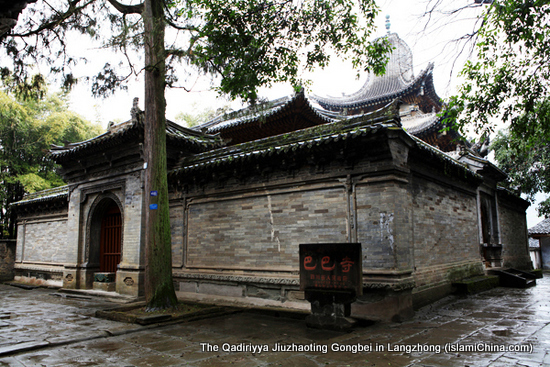 A Gongbei was built on his tomb in Langzhong which is named Jiuzhaoting Gongbei, one of the three holy places of Qadiriyya Sufi in China. The Qadiriyya Menhuan is the third largest Sufi Menhuan in China. It is believed that about 1.5% of Chinese Hui Muslims believe in Qadiriyya Sufi. The Qadiriyya Menhuan is not as popular in China as the Naqshbandi Jahriyya, or the Naqshbandi Khufiyya due to the reason that the Naqshbandi emphasize living a normal life within the Chinese society, whereas the Qadiriyya Menhuan emphasize ascetic withdrawal from society. The Qadiriyya Menhuan has branches and sub-branches including Dagongbei Menhuan, Houzihe Menhuan, Lingmingtang Menhuan, Mingyuetang Menhuan, Xiangyuantang Menhuan, Qimen Menhuan, Amen Menhuan, Wenquantang Menhuan, Tonggui Menhuan, Zhaogaojia Menhuan, Aitou Menhuan, Salar Menhuan, Haimen Menhuan, Jiucaiping Menhuan. Dagongbei Menhua was originally named after Qi Jingyi’s family name, Qijia Gongbei. 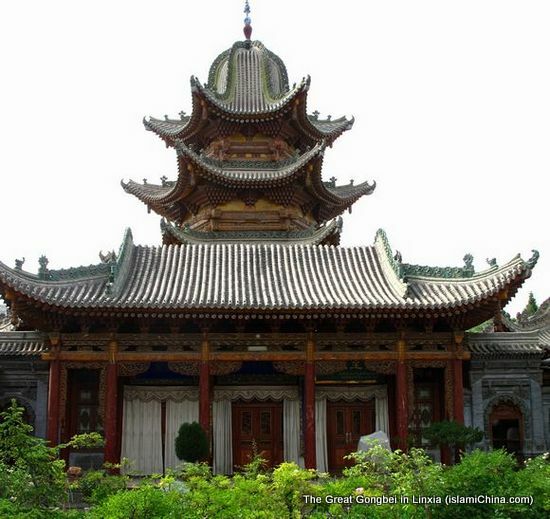 Since the architecture of Qijia Gongbei was so magnificent and gorgeous, Local Hui Muslims began to call it Dagongbei (Grand Gongbei). Qi Jingyi followed instructions from his teacher Khawaja Adbullah and lived an ascetic life. He did not marry and eschewed family life. He preached at Lulingsi in Xixiang county of Shaanxi province, Langzhong of Sichuan province and Hezhou of Gansu Province. 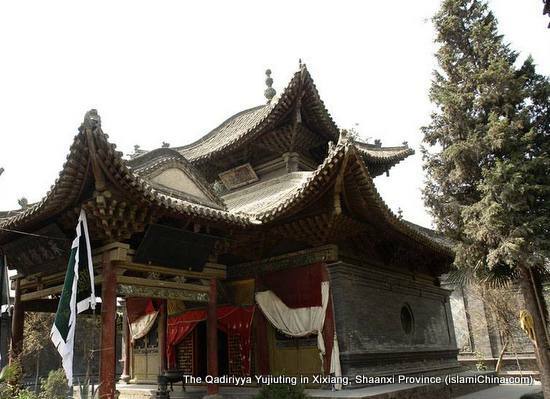 After Qi Jingyi’s death in Xixiang county in Shaanxi province, a Gongbe was built in the Lulingsi where he used to preach Qadiriyya to honor him. The Gongbei in Lulingsi is named Yujiuting Gongbei (悠久亭拱北）. Later, his body was buried in his hometown of Linxia and named Dagongbei which became the worship center of Qadiriyya Menhuan of China. The Dagongbe (大拱北）in Linxia of Gansu province, the Jiuzhaoting Gongbei （久照亭拱北） in Langzhong of Sichuan province and the Yujiuting Gongbei (悠久亭拱北) in Xixiang county of Shaanxi province are considered to be the three holiest places by Qadiriyya Sufi Menhuan in China. The Daotang of Dagongbei Menhuan is located at Dagongbei in Linxia. There are about 80,000 Dagongbei followers and there are distributed in Linxia of Gansu province, Xixiang of Shaanxi province, Langzhong of Sichuan Province, Qinghai Province and Xinjiang Uyghur Autonomous Region. Houzihe Menhua is also named Yangmen Menhuan and it was founded by Yang Baoyuan who was born in a very poor family and whose parents died when he was very young. Yang Baoyuan was raised by his elder brother and studied at local mosque during his childhood. In 1798, Yang became a student of sixth generation successor of Qadiriyya, An Daozu (Grand Master An). He performed Hajj in 1800 and visited many places in Middle East. Yang was appointed to be the seventh successor of Qadiriyya. After his death, his disciples built a Gongbei on his tomb in Houzihe and it is generally regarded as Yangmen Menhuan as well. The Daotang of Houhezi Menhuan is located at Houhezi Gongbei in Qinghai Province. There are about 5,000 Houzihe Menhuan followers and there are distributed in Guyuan of Ningxi Hui Autonomous Region, Minhe and Datong of Qinghai province and Kangle of Gansu Province. Lingmingtang Menhuan was founded by Ma Yilong who was born in a poor family in Lanzhou. He lived a very simple life by means of begging. His followers built a Daotang (Hall of the Path or Doctrine, Hall of Teaching) which is the center of a Menhuan in the area named Xiyuan in Lanzhou. Since Ma Yilong’s childhood name was Lingming, the Menhuan founded by him was named Lingming Menhuan. There are about 3,000 Chinese speaking Muslim Hui families who are Lingmingtang Menhuan followers and there are distributed in Lanzhou, Kangle and Guanghe of Gansu Province, Guyuan of Ningxia Hui Autonomous Region, Hami of Xinjiang Uyghur Autonomous Region. Mingyuetang Menhuan was founded by Ma Renpu who was born in a farmer’s family in Central China’s Henan province in 1910. He left his hometown and migrated to Guyuan of Ningxia Hui Autonomous Region and stared business of trading furs and livestocks between Guyuan and Lanzhou. He helped 18 Muslim Hui families migrated from his hometown in Henan province to migrate to place where he lived in Guyuan and built a mosque for the village. He finally became the leader of those migrated Muslims in Guyuan and joined Lingmingtang Menhuan. His followers named the Menhuan founded by him Mingyuetang Menhuan. The Mingyuetang Menhuan is a sub-branch menhuan of Mingyuetang Menhuan. The Daotang of Mingyuetang Menhuan is located at Sanying of Ningxia Hui Autonomous Region. There are about 500 Mingyuetang Menhuan followers and there are distributed in Guyuan of Ningxi Hui Autonomous Region and Mengxian of Henan Province. Xiangyuantang Menhuan is also named Haimen, Shamen Menhuan. Xiangyuantang Menhuan was founded by Hai Kuo who was born in 1738 in Lanzhou. Hai kuo was also named Hai Si Tai Ye who died in Yinchuan of Ningxia Hui Autonomous Region. Before his death, he asked his followers to send his walking stick, prayer beads to his student Sha Manla as a proof of preaching. Sha Manla later buried the walking stick and prayer beads and named the tomb Xiangyuantang. The Daotang of Xiangyuantang Menhuan is located at Lanzhou Shajia Gongbei of Gansu Province. There are about 500 Chinese speaking Muslim Hui families who are Xiangyuantang Menhuan followers and there are distributed in Lanzhou and Linxia of Gansu Province, Ningxia of Ningxia Hui Autonomous Region. Amen Menhuan was founded by Mohammad Noordin who was preaching Sufi by traveling to various places. Since Mohammad Noordin was from Arabia, Chinese speaking Muslim Hui people call the Menhuan founded by him Amen meaning Arabia Menhuan. Mohammad Noordin came to Lanzhou during the period between 1851 and 1862 and he was highly respected by local Hui Muslims. After his death in Lanzhou, a tomb was built at a place named Panjiaba in Lanzhou and it was named Amen Gongbei. There are about 10 Chinese speaking Muslim Hui families who are Amen Menhuan followers and they lived in Lanzhou of Gansu province. Qimen Menhuan was founded by Ma Deming who was born in a farmer’s family in Guyuan of Ningxia. Before Ma Deming, there were four spiritual practitioners or meditators preaching Qadiriyya with no specific areas and Gongbei. In 1928, he began to preach in Liangjiabu of Guyuan. He was highly respected by local Muslims after he performed Hajj. Qimen Menhuan became recognized by local Muslims. The Daotang of Qimen Menhuan is located at Guyuan Liangjiabu Gongbei of Ningxia and Tongxin Shitangling Gongbei of Gansu Province. There are about 400 Chinese speaking Muslim Hui families who are Qimen Menhuan followers and they lived in Guyuan of Ningxia Hui Autonomous Region. Wenquantang Menhuan was founded by Ma Wequan who is also called Mohammad Ibrahim. This menhuan was named after its founder’s given name Wenquan. He performed Hajj during Qing Emperor Tongzhi’s Reign and studied Qadiriyya Sufi theory in the Middle East. Upon his return to China, the Muslim Hui people rebelled and were fighting against Qing government, he then preached Fujian, Guangxi, Yunnan and Sichuan Provinces. When he was preaching in his hometown of Gansu, he was arrested and killed by the Qing Government. Later his followers built a Gongbei for him at Gengjiazhuang in Lanzhou and named it Gengjiazhuang Gongbei, also named Wenquantang. The Daotang of Wenquantang Menhuan is located at Gengjiazhuang Gongbei in Lanzhou. There are over 100 Chinese speaking Muslim Hui families who are Wenquantang Menhuan followers and they lived in Linxia, Lanzhou of Gansu province, Xunhua of Qinghai province. Tonggui Menhuan was founded by Ma Jingui who was born in Tonggui town of Yinchuan in Ningxia. This Menhuan was named after the founder’s birth place of Tonggui. At the beginning of the 20th century, He studied Qadiriyya from Imam Ma who was a student of Ma Wenquan. There are over 1000 Chinese speaking Muslim Hui people who are Tonggui Menhuan followers and they lived in Tonggui, Yongning and Pingluo of Ningxia Hui Autonomous Region. Yatou Menhuan was founded by Fatah (1865-1938) who was born in a Salar family. Also named Hu Ahong, he moved to Yatouping in Linxia later. Since the place where he lived is named Yatouping, the Menhuan founded by him is named Yatou Menhuan. Yatou Menhuan combines both teachings of Qadiriyya and Khufiyya. Yatou Menhuan sometimes call itself Qadiriyya, sometimes call itself Khufiyya. It was considered to be a Khufiyya Menhuan in tradition. However, its practice and doctrine suggest that it belongs to Qadiriyya Menhuan. The Daotang of Yatou Menhuan is located at Yatou, Jishishan of Linxia in Gansu Province. There are over 1000 Chinese speaking Muslim Hui families who are Yatou Menhuan followers and they lived in Linxia, Lanzhou of Gansu province; Xunhua and Xining of Qinghai province. Gaozhaojia Menhuan was founded by Mashihaya, born in a Baoan family in a place named Gaozhaojia. Therefore the Menhuan founded by Mashihaya was named Gaozhaojia Menhua. Mashihaya used to be a disciple of Yatou Menhuan before he started preaching Gaozhaojia Menhuan in a place named Moshigou in the Guide county of Qinghai province. After five years of preaching Gaozhaojia Menhuan in Qinghai, he returned his home in Gaozhaojia in Baoan. He successfully converted Gao and Li families of Baoan Ethnic group into Gaozhaojia Menhuan after his return. The Daotang of Gaozhaojia Menhuan is located at Jishishan of Linxia in Gansu Province. There are over 200 Chinese speaking Muslim Hui families who are Gaozhaojia Menhuan followers and they lived in Linxia of Gansu province. Salar Jiao Menhuan was founded by Su Washi (1880-1949) who was born in Xunhua of Qinghai province. Since he was from the ethnic Salar group, the Menhuan founded by him was named Salar Jiao Menhuan. Su Washi preached Salar Jiao Menhuan during 1940s in Xunhua. The Daotang of Salar Jiao Menhuan is located at Xunhua in Qinghai Province. There are over 1000 Chinese speaking Muslim Hui families who are Salar Jiao Menhuan followers and they lived in Linxia of Gansu province, Xunhua and Xining of Qinghai province. Distribution: Linxia of Gansu Province. Founded by An Hongwei, a Hui Muslim born in Pingliang of Gansu province. Jiucaiping Menhuan is a sub-branch of Houzihe Yangmen Menhuan. An Hongwei studied Qadiriyya under the 7th Daozu of Houhezi Gongbei, Yang Baoyuan. An Hongwei built the Houzihe Gongbei for Yang Yuanbao. He started preaching in Datong of Qinghai province, Haiyuan and Guyuan of Ningxia province and finally settled down in Jiucaiping, hence the name Jiucaiping Menhuan. The Daotang of Jiucaiping Menhuan is located at Haiyuan of Ningxia Hui Autonomous Region. There are over 5000 Chinese speaking Muslim Hui people who are Jiucaiping Menhuan followers and they lived in Xihaigu of Ningxia Hui Autonomous Region.